The display specialist ELECTRONIC ASSEMBLY has launched a multi-faceted EA DOG product family especially designed for low-power handheld applications. They are all operated at 3.3 V as a standard and require hardly more than 150 ~ 350 µA. The optional LED illumination is also designed for 3.3 V. The brightest white LED starts at 3 mA. 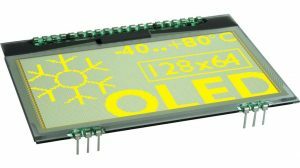 The panels, which are only 2 mm thick, are currently available as text and graphic displays in 10 different sizes and five different display technologies: as transmissive, reflective or blue STN as well as positive or negative FSTN. All technologies are standard and available starting from 1 unit. The displays can be combined with six separate backlights in white, amber, blue, red, yellow/green and full colour by simply plugging them together. Owing to the compact design, an extremely flat display module with a maximum height of 5.8 mm is obtained when combined with lighting. Without any additional mounting effort, it can be soldered directly onto the circuit board with a 2.54 mm grid. The text displays are supplied with 1*8, 2*16, 4*10 (switchable to double font height 2*10) as well as 4*16 and 4*20 characters. The graphic variants are available in the resolutions 122*32, 102*64, 160*104, 240*64 and 240*128 pixels. The outer dimensions vary between 39 x 41 and 94 x 67 mm. All displays are equipped with a SPI interface, the text displays additionally have a 4-/8-bit interface and some displays can also be addressed via I²C. Thanks to integrated temperature compensation, the thermal application range of the displays covers temperatures from -20 to 70 °C. As a further special feature, individual EA DOGs support English, European and Cyrillic character sets in a single display. The displays are available in large quantities as well as small quantities at short notice. ELECTRONIC ASSEMBLY guarantees a long-term availability of up to 10 years. Developers have access to an USB test board with PC connection and suitable Windows software, including a free simulator and a great deal of C and microcontroller codes for an easy system start and prototyping.